It's almost here Tributes! In celebration of the final 24 hours until the trailer for The Hunger Games: Mockingjay Part 1 gets released online, Lionsgate is giving us our second sneak peek at our long-awaited trailer via Instagram. 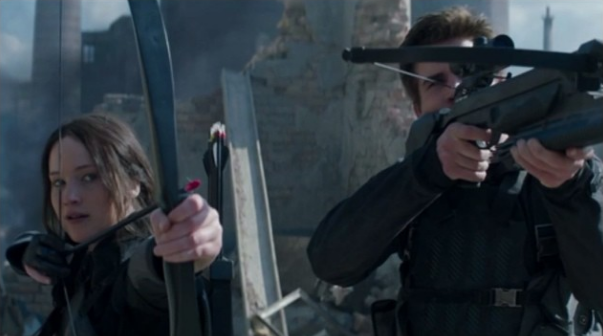 The second countdown video features Katniss and Gale shooting at Capitol hovercrafts in District 8. Check it out below. UPDATE: A Youtube version of the 2nd Sneak Peek at the Mockingjay Part 1 Trailer has now been released! Check it out. Follow us on Twitter @TheHungerGamers or come back here tomorrow at 11:00 am CT to see the official trailer for Mockingjay Part 1. TheHungerGamers.net will post it the moment it debuts at TheHungerGamesExclusive.com. What are your hopes for tomorrow's trailer? Are you excited? Let us know in the comments.